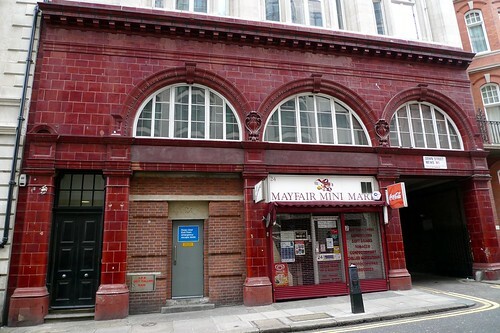 Ajit Chambers from The Old London Underground Company has been moved a large step closer to re-opening 26 old abandoned Tube stations. Although some newspapers (The Independent & Standard) have recently reported that Boris has given the go-ahead, the exact details are that Boris has asked Richard Parry (Strategy and Commercial Director for London Underground) and Anthony Browne (the mayor's economics director) to work together to help with the due diligence needed to get the project off the ground.. This will be a thorough investigation on the engineering, health & safety and risks involved in re-opening the stations. I had a long conversation with Ajit on Monday night to find out more about the plans which he's been working full time on over the past two years. Ajit has put together a consortium of companies to work on a ton of items including finance, engineering, marketing, health & safety so that the company is already to built and ready to "go operational immediately" on the day the green light is given to the first site. I first blogged about Chambers in September 2009, when plans had been initially "warmly accepted" by the Mayor. Since then he has been working till the small hours determined to cover every small detail see the project through. He knows that this is a major challenge, there are huge hurdles to face, but he said that's what makes it interesting to him and his team. Essentially Chambers' model "allows private business to profit while adding value to the sites through funding the addition of health & safety sequentially over the term of the leases that are still owned by TfL. They will get a revenue stream (without paying anything) and at the end of the lease term TfL will have the option to take the stations back over with health and safety certification allowing them to be used for infrastructure or continue taking profit in a ‘business as usual’ format under TfL's ownership as a landlord". The plan allows for each station will have three different types of revenue streams across different market sectors, much like an equity fund - tourism, storage space and entertainment venues (venues will become more than just bars, restaurants & clubs). This will enable cross marketing for very different experiences. Chambers said "For example if one private business wanted to open up a station for rock climbing, there would also be space for a coffee, juice bar, restaurant or jazz club to run alongside and service the same customers". 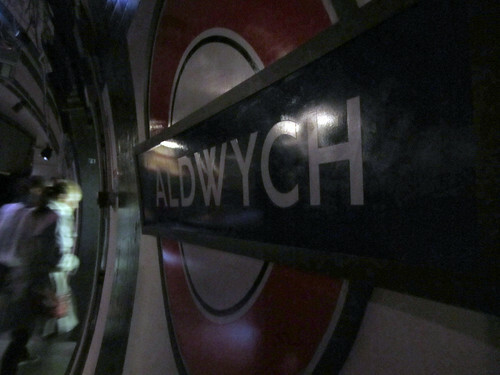 Some of the stations that he is looking at reopening are Down Street, Aldwych, South Kentish Town, Brompton Road and York Road. I asked whether he felt it would be easier getting backing for some rather than others. Chambers said that this was up to the businesses providing the finance. He said "I know that there are 4 -6 stations that would be easier to set up to make revenue than others. But I don't want this to be totally my decision. That's also why it's so great to have Richard Parry on board. He has the engineering and London Underground experience to advise which options are most feasible." I asked whether there were any examples of closed subway systems outside of London opening. He said. "I spoke to The Mayor of New Yorks colleagues two years ago, and they've managed to open up their old station under City Hall already, how did we manage to let the Americans go first!? However at the moment it's just a tour at specific times and for specific groups of people. They haven’t managed to add volume as they haven't got the financial structure that I have designed for London." Always enthusiastic, as I know there's a huge amount of interest in London right now in exploring mysterious parts of the capital (including the Underground), I asked when he felt the earliest might be for one of the stations to re-opening. "I'm throwing everything I have at it to get one open in time for the Olympics." he said. This was actually much sooner than I thought. "Basically a station could be opened fairly quickly for a simple tourist walk-through. That will bring in enough turnover to keep businesses happy as the station is re-built and renovated behind Perspex as part of the attraction." I had seen comments on the internet questioning whether Chambers actually had a business at all (or that it had gone under). Chambers, an ex-banker, wasn't as offended by me bringing up this issue as I thought he'd be. He felt that at this stage talking about whether he did or didn't have a limited company wasn't really relevant until an investor group was decided on. What was relevant was having the business ready to deliver and he has worked hard to get the consortium of companies in place. He said "Any limited company or Joint Venture contract will act as the vehicle for the work when the investor group is formed. 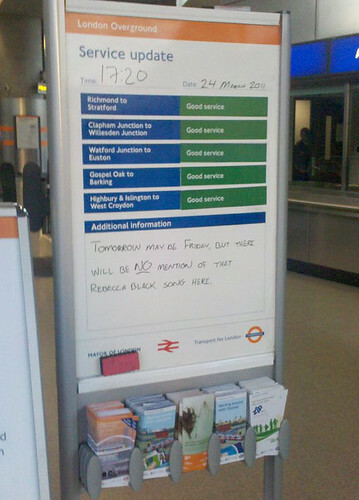 Besides, the option of London Underground running more of the show, will always be available to Richard and Anthony". Chambers has had personal meetings with over two hundred companies including the Merlin Group, Visit London, Mott Macdonald, Kingsbridge, Sir-Robert-Mcalpine, Coca Cola, Vodafone, The Museum of London, Marsh, Morris Visitor Publications, Silverman Sherliker, Crossrail, CBS Outdoor, Wragge, Jaia, Sainsbury’s, EDF, and City of London Corporation. He said "this is to specifically ‘pre-set up’ each sector's inter-relationships from funding to global marketing the product in aircraft and hotels in Europe and the Americas". As mentioned above, seeing the sites as tourist attractions is only a third of the equation. He's in final talks with an Austrian company who are keen to make one of the stations into a museum. Their business plan shows a 16 million Euro Return on Investment after year four on site one. Chambers' financial team has calculated a total turnover of £200 million would be created for the economy during the lifecycle of the build of the group of sites and is kicking off an exciting promotion where he will talk at the opening day of Grand Designs LIVE with Kevin McCloud to run a UK wide competition to design the first site. With more long working days ending at 5am, Ajit is working on a laptop that has already had its screen and hard drive replaced once, the keyboard twice, the mother board and the graphics card twice through pure working hours on the project. Chambers is making contacts on an hourly basis with businesspeople, designers and individuals with the ability and the will to build what could be a fabulous group of venues. 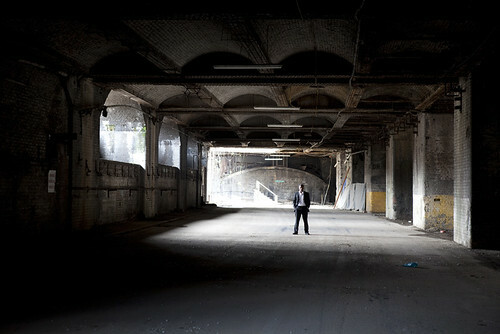 He said "This product is deserved by all of London, and we are merely the management consultancy creating the project." With dogged determination to see this through and the excellent guidance of Richard Parry and Anthony Browne, he is edging ever closer to the end goal. As Ajit says "behind every product is a person - the person who changed their pencil-drawn idea into a reality for everyone to enjoy and use.". I wish him every success with the venture and watch this space, as Ajit has promised to keep us updated with developments. 2011/12 are being discussed at a Board Meeting today. In the huge Business Plan document you'll see the plans for all of London's transport and you've probably already heard Boris trumpeting about the £7.6 billion he's cutting from TfL's budget over the next seven years. Admittedly he spent less time trumpeting about the fact that the extra £2 billion in cuts will mean we're likely to see fares rise by 2% above inflation rate - an annual rise of 7% - over the next four years. But then again, what's new? At the end of the document, TfL do some star gazing and attempt to show us London's Tube & Rail Network Map for 2015 and 2019. Look at page 85 and page 86 of the PDF to see the maps in detail. The biggest change for 2015 will be the completion of the London Overground with an extension from Clapham Junction. This will make the Ginger Line, much like the M25 of the rails. There's a cable car connecting Royal Victoria and North Greenwich and the DLR will extend from Canning Town to Stratford International. Zoom forward to 2019 and you'll see the purple line of Crossrail running through the map. Note the heavy blue lines marking the interchanges at Barbican and Farringdon. No idea what they mean at the moment but I'm sure someone with a greater knowledge of Crossrail can enlighten me. 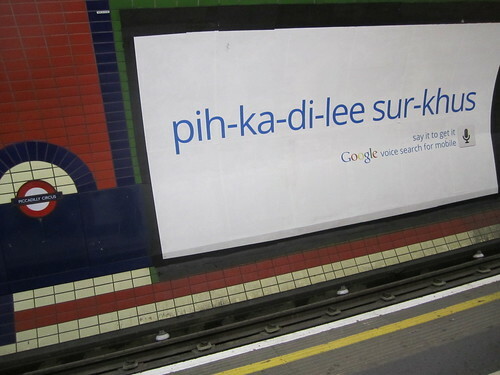 You've probably seen a number of ads for Google's voice search for mobile popping up around the London Underground & National Rail. They kind of phoenetically spell out words how they could be pronounced. So you'll see popular search terms like "brey-king nyooz", "weh-thuh for-karst" and the like, but I particularly like the station specific ones. I saw this for Piccadilly Circus last night and @iamjamesward also saw one at Worcester Park station or rather "Woo-stah pahrk". This got me thinking that maybe the Tube could do with some phoenetic signs for some station names. I always have a problem with saying Holborn. I tend to say "Whole Born" even though I know it should be "Ho Bun" - well at least I think it should be that. It's certainly how the automated announcer pronounces it. There's a guy at my home station who constantly announces that District Line trains are going to "Upminister". I'm sure we've all bumped into our fair share of tourists (usually from across the pond) who ask how to get to "Lie Sess Ter Square". Are there any particular stations that are pronounced in ways that annoy you? Or any stations that you think are commonly mis-pronounced & people need a helping hand with? 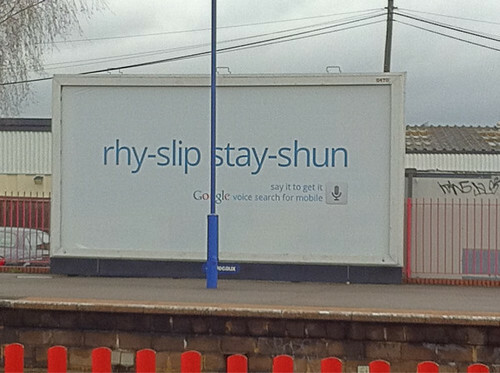 Update - @callummay spotted the Google Ad for Ruislip station. So looks like Google agreed with the comments that it was one people needed help with! Keep the suggestions and any station name pictures coming - thanks! 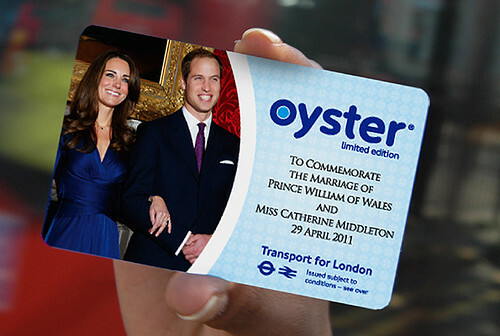 TfL are to produce 750,000 special Oyster cards to mark the wedding of Prince William & Kate Middleton. Not only that but two of the three quarters of a million cards will be given to William & Kate in case they ever get the urge to use the London Underground. As blogged last year, Kulveer Ranger, the Mayor’s transport adviser, said "We want to help celebrate the fantastic occasion that will be the royal wedding. It's a good way to bring a level of excitement and ingenuity to something we rely on every day." The official design has just been unveiled by TfL. The £5 deposit and £5 minimum top-up will apply as normal for the card and it will be available from 21 April 2011. I'm sure you'll also see plenty for sale on eBay. 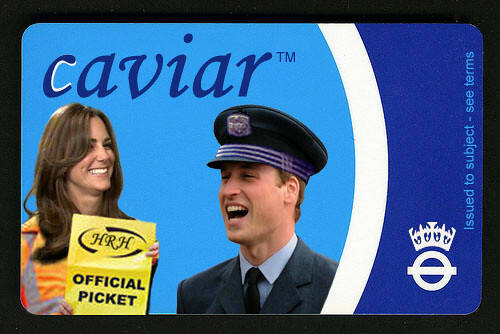 It will be the first "limited edition" Oyster card ever to be put on general release. Meanwhile if you're after a Royal Wedding tea towel, London Transport Museum have just produced one that is fairly subtle. 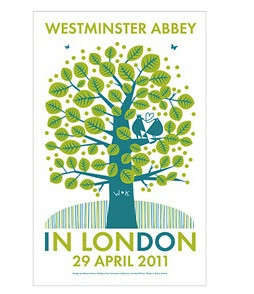 Designed by Maria Holmer Dahlgren, it has Kate & William's initials carved in a tree. You'll also see I DO highlighted in the words In London, which is actually reasonably tasteful. If you've seen any other transport related Royal Wedding items, let us know. 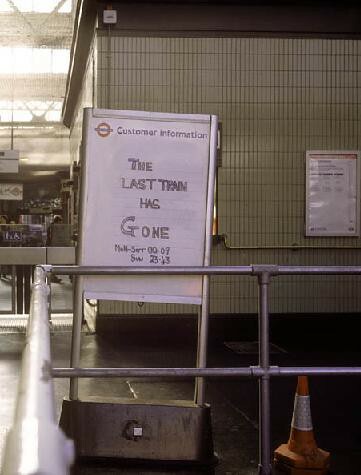 Looks like Warwick Avenue Tube station has some competition from the guys at Shoreditch High Street station, when it comes to messages on the service update boards. They're still missing the little illustrations that Tim Pinn from Warwick Avenue London Underground adds to his, but hopefully they've put London Overground (aka the Ginger Line) on the funny whiteboard messages map! 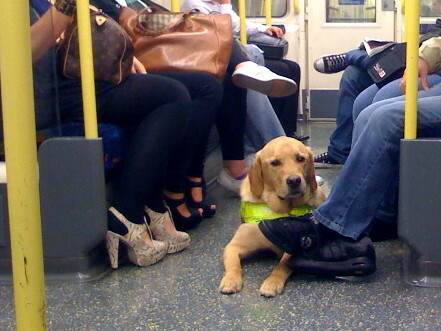 Did you know that even Guide Dogs aren't allowed to travel on moving escalators on the Tube? The "dogs must be carried" rule applies to them, making it very difficult for visually impaired people. 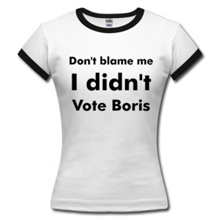 Fortunately it looks like the by-law forcing this could be changed if Boris honours a commitment he made yesterday at City Hall. Caroline Pidgeon, leader of the Liberal Democrat London Assembly Group, raised the issue at yesterday's Mayor’s Question Time session. A week before was at People's Question time and told Boris how difficult it was for him to access the Tube. Pidgeon said: "The ban on blind people being able to take a guide dog onto moving escalators is outdated and must be changed. There is now clear evidence that trained guide dogs can safely use moving escalators so ending the insulting service that many blind people currently face when they use the Tube." Currently TfL's guidance for those using Guide Dogs states "If you have an assistance dog, staff will help you avoid escalators where possible, or stop them to allow you and your dog to walk. However, at busy times it may not be possible to stop escalators immediately, as it may cause overcrowding. If you feel able, you may carry your dog on the escalator." 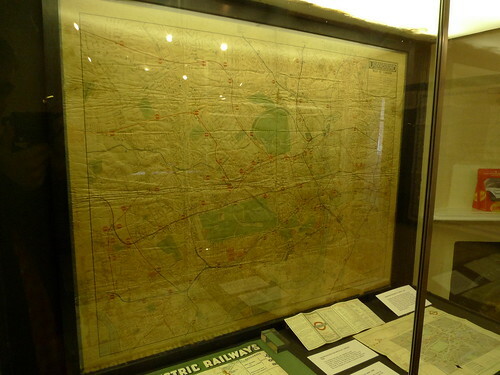 Your last chance to see a display on the development of the London Underground map. There's a small exhibition at the soon to be closed Church Farmhouse Museum in Hendon which runs until Sunday 27th March. Harry Beck, came from Finchley and was the first person to simplify the design of the map by avoiding geographical scale. His map, reputedly based on an electrical wiring diagram, dispensed with realism in favour of readability and still the inspiration for many other subway maps around the world. Londonist's M@ says "Highlights include a map showing a thwarted extension of the Northern Line to Elstree, a pre-Beck chart showing the exact tunnel routes beneath London’s streets, and the much maligned Hutchinson map of 1960 — an ugly duckling beside Beck’s creations but innovative in its use of station symbols." 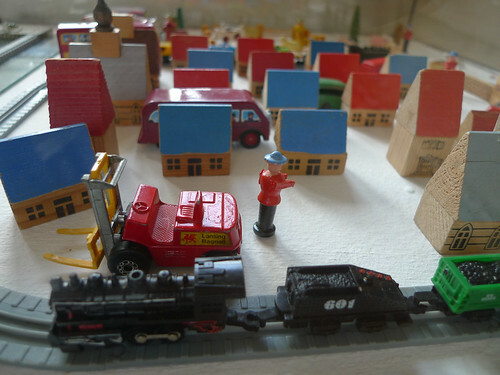 There's also a small exhibition of 20th Century games and toys at the musuem. Sadly, Barnet Council are withdrawing the museum's funding at the end of the financial year. Thanks to John Keogh for the above picture and there are others including the lovely garden in the museum's grounds in his Flickr stream. Admission to the exhibition is free and the nearest Tube is Hendon Central. More details on the opening times are on the Museum's site. 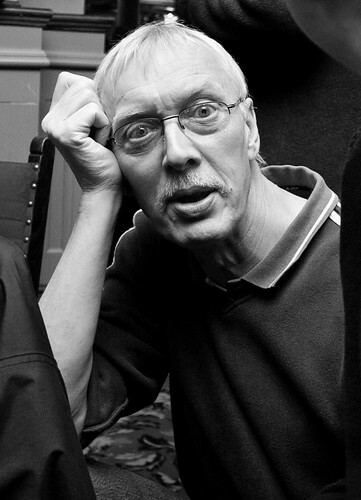 David Maloney, the creator of the District Dave London Underground forum passed away last Thursday. Many of you who read this blog will have visited his forum over the years. It began in the late nineties as District Dave’s London Underground Site and Dave's was one of the first Tube websites I read. 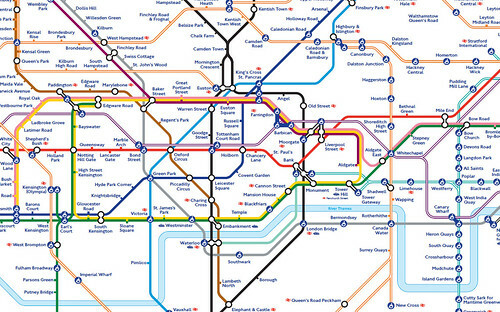 We shared links way back when there were only a handful of places online to share a discussion about the Tube. His family and forum admins have written the following obituary which I'd like to share on the blog. "Dave Maloney, a London Underground Instructor Operator on the District Line, perhaps better known to many as District Dave, has died aged 59. Dave was webmaster of District Dave’s London Underground Site, on which he would enlighten readers about the varied life behind the LU roundel. The website became a firm favourite for enthusiasts and railway professionals alike, who wanted to learn more about the Underground or discover what life was like as a Train Operator. However, it was the visionary in Dave, in creating his Proboards forum (and an earlier Bravenet version), with its quality and discipline, that became a rare gem amongst forums and allowed railway professionals and enthusiasts to interact, share and learn about the Underground. Dave never intended to be a railwayman and for many years, like millions of other Londoners, he was a commuter on the Underground. However in the late 1990’s after 28 years with the same firm, he parted company with them and was simply looking for his next challenge. By pure chance, two neighbours who worked for London Underground independently suggested that he consider joining as a Station Assistant, even if only in the short term. Dave successfully applied and stayed with the job on the station until a spare training day a few months later brought about thoughts of becoming a Train Operator. Over the years Dave’s interests had become both numerous and varied. For example an early interest in motorbikes caused him to regularly disappear on sunny days leaving his wife to hope he’d reappear sometime for a meal. It became a family joke that it always rained if she went out with him on the back. Dave was also a keen guitarist and regularly played in a band. In typical fashion, he would be first to arrive at a gig and set everything up and the last to leave, overloading his car with the gear and then looking after it until the next booking. He also had a gentle and pleasant singing voice, although he was a bit shy and very modest about it. He and his son Chris went shooting, fishing, cycling and enjoyed anything to do with planes and motorsport. Dave especially liked boating holidays. He found them very relaxing and planned on getting a small boat when he retired. He liked sport but preferred watching it, beer in hand, than taking part! He was also especially fond of cats and accumulated four but it was the ‘District Dave’ brand that he was particularly proud of and he enjoyed the social side of that, as with all his interests. Ultimately it was Dave's amiable personality, humility, professionalism, unstinting infectious enthusiasm and willingness to help and develop others that resulted in him being held in such high esteem by colleagues, friends and railway enthusiasts. He even became widely respected and admired by people whom he had never met across the globe... to quote Kentucky Tony from the forum "You are missed, Dave, even in the hills of Kentucky. Quite an accomplishment for a District driver!" His passing has prompted those who knew him in person or online to reflect upon the qualities we all aspire to, but which few of us ever achieve. David Maloney was one of those very few and the forum membership have resolved that the District Dave London Underground forum will continue to uphold his values and remain his legacy. Dave Maloney died peacefully at home on the morning of 17th March 2011 after a long battle with heart problems and is survived by his wife Val and son Chris." I'm only sorry I never got to meet Dave in person and hope that his forum will continue to share knowledge about the Tube so that District Dave's name lives on. How about some underwater music this weekend? 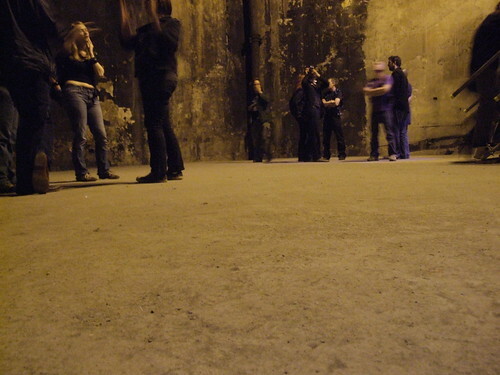 On the 19th and 20th March The Brunel Museum at Rotherhithe will be holding two concerts in its underground hall beneath the Thames. On Saturday 19th March music by Handel, Mendelssohn and William Horsley will be performed underground in the remarkable acoustics of the Grand Entrance Hall. Descend by low entrance and temporary staircase into a secret chamber to hear about the World’s First Underwater Concert and listen to the Rotherhithe & Bermondsey Choral Society. Each performance begins with an adventurous descent and a dramatic story including little known facts about the Thames Tunnel & Brunel. For example did you know that Brunel's wife Mary, initially captured the heart of Felix Mendelssohn, but she chose the engineer over the musician? Performances at: 14.00 15.00 16.00 Tickets £5. For more details and other Museum events for National Science & Engineering Week, visit The Brunel Museum. Nearest stations: Rotherhithe, Bermondsey & Canada Water. You can hear some of the rehearsals and learn more about the Thames Tunnel on BBC Radio 4's PM where Chris Vallance interviews the Museum's Director Robert Hulse. 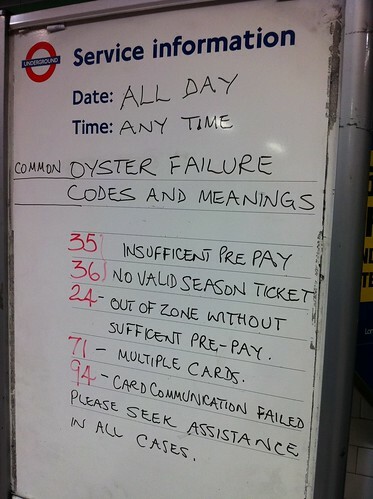 A London Underground member of staff at Balham Tube took the trouble to highlight the meaning of several common Oyster Card failure code messages. Nick Ludlam, who took the picture, felt we needed more look up tables. Would you like to see more signs like this across the network? Considering there are around 100 error code messages including the cryptic "82 - Illogical use of ticket" , "33 - Illogical interchange through gates" and "55 - Possible Dumbbell", the Tube would need a very large whiteboard to list them all! However, there's certainly something to be said in knowing what the most common ones mean. Also does anyone know how many of these error codes still let people through the gates - even if they cause the barriers to double beep? It's all very well seeing a code (and knowing what it means if you can't get out", but what's the point of a code if you can still get through the gates. I'm often behind people going through gates which beep twice and flash "Seek assistance" and I've hardly seen anyone return back to see what the problem is. I don't use PrePay as I have an annual Oyster Card, but if the double beep meant I was going to be charged more than I should be paying, I'd certainly pay attention to the codes & beeps. On Tuesday 22nd March Howard Collins, Chief Operating Officer of London Underground will be discussing recent Tube performance and you'll have the opportunity to put questions to him through transport watchdog London TravelWatch. This is a great opportunity to ask Howard Collins anything about your Tube journey experience. To get involved you can email questions to info@londontravelwatch.org.uk or Tweet them to @LonTravelWatch. The meeting is public so if you're around for an hour from 11am on 22nd March 2011, feel free to go along. It's being held at London TravelWatch's offices. Jo DeBank from the organisation said "I’ll be ‘live tweeting’ the Q & A session and we're happy to take questions in advance by email too. We cannot guarantee that all questions will be answered on the day, but we will try to ensure that all questions are answered and responses posted on our website". 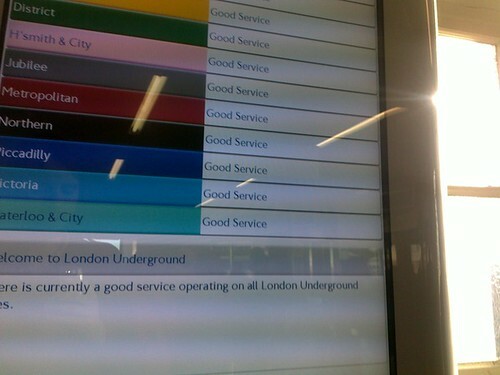 It's rare that you will see "a good service is operating on all London Underground Lines" signs for a whole day (probably why this picture from @iamjamesward had over 14,000 views when it was posted on April Fool's day!). His April Fool wasn't so far from the truth. Good service on all lines is so rare that it actually only happened once last year on the 11th May 2010. Under the Freedom of Information Act, The Standard learnt it was the only day there were no delays or suspensions on all lines. Caroline Pidgeon, formerly Chair of the London Assembly's Transport Committee, said it was "astonishing given the investment to date in the Tube, that all passengers only received a good service on one day". Jo de Bank of London Travelwatch said: "People do understand the upgrade work but in the meantime Tube passengers are suffering worse services than they expect and that should be resolved." She echoed what I always say and try to do. "They should remember they are entitled to a refund if their journey is disrupted and claim it." It's really easy to claim if your journey is delayed by more than 15 minutes under the Customer Charter. Yet only last week it was reported that only 330,000 of a potential 11 million Tube passengers claimed compensation for delays in 2010. This year I've already made five claims and had a refund of the equivalent value of a single journey for each claim. I know that it's easy to forget, but if everyone made these claims more often TfL would really have to step up improving the service or they'd be losing a lot of money. We often feel helpless about delays and vent our frustration on Twitter and our friends' ears. It would make more sense, and in the long run improve the system, if we spent those few minutes filling in a Customer Charter form. Since March 2010, there's even a couple of iPhone apps - Tube Refund & iRefund which mean you can claim as your delay is taking place. 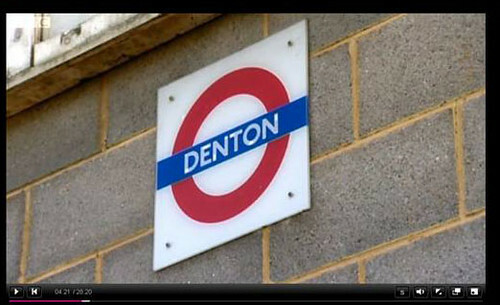 Ever heard of Denton Tube station? It has a roundel. It's got a dirty looking train on the platform with some graffiti on it. 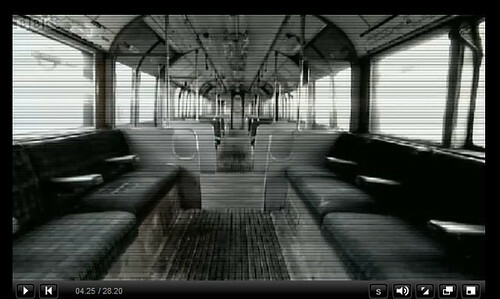 It's hard to make out the moquette from the train's seats looking at this screengrab. Would it help to know that the station is not actually in London, but in Gravesend? Still guessing? 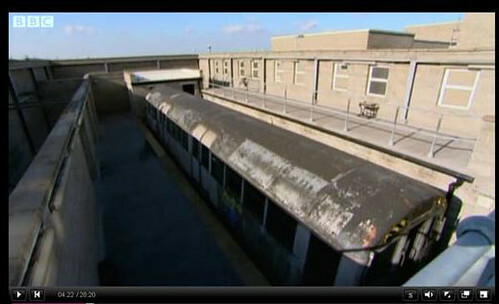 Thanks to Allan Williams aka @Staffsplate, I learnt that the Specialist Police Training centre in Gravesend has a mock town, complete with its own lifesize Tube station, so that the Met Police can learn how to handle public disturbances. In addition to the mock Tube there's also a mock stadium. Allan discovered this on the BBC children's programme Cop School. The kids in the show didn't get a chance to try it out when they were learning how to dominate and contain suspected criminals, just by using their voice - so you won't see that it in the clip. However, it's interesting knowing that the police do have training of how to handle people in a real London Underground train, before putting it into practice. So now you can add Denton Tube station to West Ashfield Tube Station, another mock station, that IanVisits visited last year - this one's just for training London Underground staff. I wonder where the name Denton came from? Any theories? Today's the Bakerloo Line's 105th Birthday. The line which ran from Baker Street to Lambeth North, originally called the "Baker Street and Waterloo Railway", opened on the 10th March 1906. Captain GHF Nichols ("Quex", the diarist in the Evening News) nicknamed it the Bakerloo. 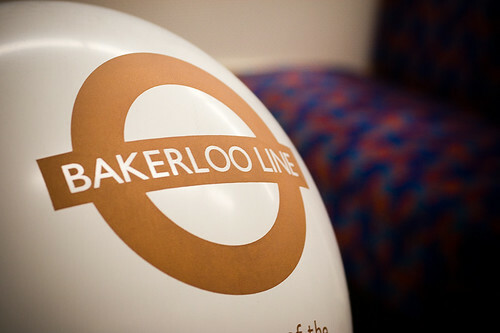 The name stuck with the public and in July 1906 it was officially changed to the Bakerloo Railway. According to TfL, rumour has it that the Bakerloo line originated from the desire of a few London businessmen to get to and from Lord's Cricket Ground as quickly as possible. Maida Vale station on the Bakerloo Line, was the first London station to have all-female staff. At it's opening on 6th June 1915 it was run by two porters, two booking clerks, two ticket collectors and two relief ticket collector-booking clerks. It has the same birthday as Chuck Norris. Not sure if there's a connection! 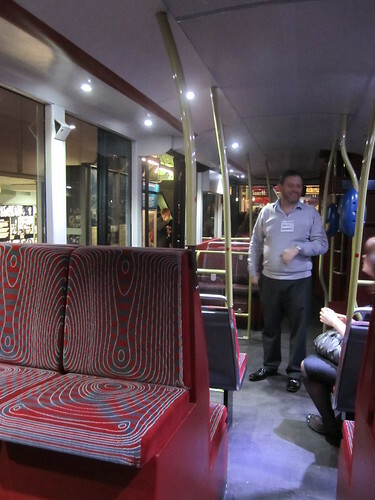 Forgive the rare non Tube post, but last night, The Londoneer & myself were treated to a sneak peek tour of the inside of the new London bus which is currently on display at London Transport Museum. I don't normally get excited about buses, but couldn't turn down the unique opportunity to see inside the full sized mock up & take a few photos. I loved the mixture of 21st century sleekness and modernity on the outside and the lovely retro touches which hark back to the old Routemaster on the inside. I'd half expected some eyewateringly bright upholstery (like the new London Underground seats), but was really surprised. 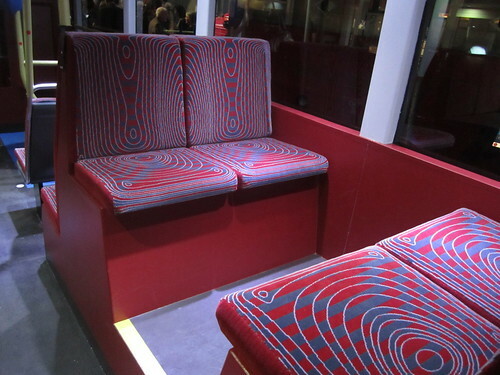 The moquette on the seats was wonderful and kind of echoed the body's shape. As you can see from the pictures there a lot more seats facing the back of the bus. A large rear window makes it easy to see where you've been! When you go upstairs (or come downstairs) there's a pane of glass running along the side, so you can see outside. The platform to the rear set of stairs is really similar to the old Routemaster decks which I had fond memories of jumping on when the bus was still moving. 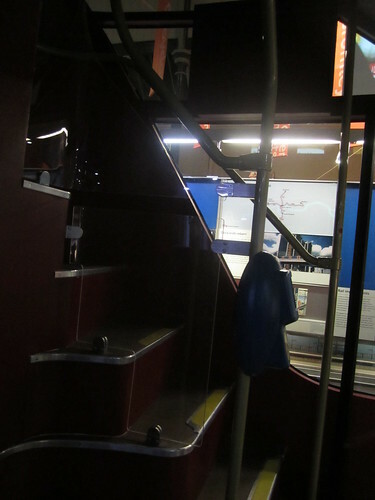 However, unlike the old buses, the platform will have the facility to be closed off at certain times (by a second member of staff), mainly at night. Upstairs I was convinced the roof was lower than on current buses, but was informed it's at the same height. The new bus will also be air conditioned and due to the latest hybrid technology and will be 40% more fuel efficient than conventional diesel buses - which is all good. The mock-up will be used to fine-tune the design of the bus before a prototype is manufactured by Wrightbus Ltd later this year and the first five new buses will enter service in 2012. 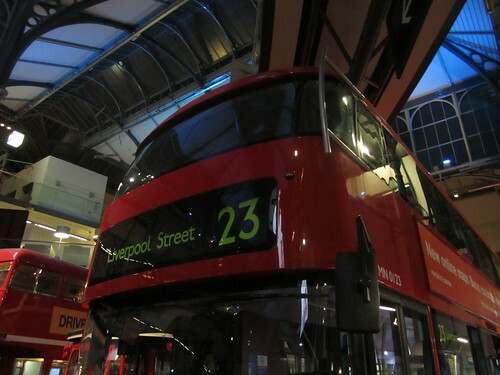 The new London bus is on display at London Transport Museum until June 2011. There will also be two free open evenings to allow people to see the bus free of charge (sadly only the outside of the bus), the first on Friday 13th May 2011 (as part of Museums at Night) and the second on May 20th 2011. There's also a whole range of bus related family activities taking place in April around the Easter holidays, ranging from storytelling to designing a new uniform for the driver and second crew member. Full details in the Events section of the Museum's site. 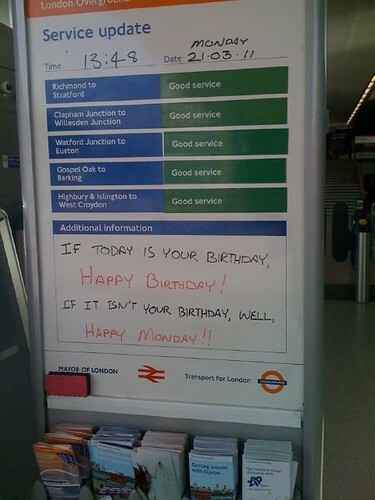 The old chestnut of the possiblity of the London Underground running for 24 hours has reared its head again. Firstly as a vote catcher for Lembit Opik who's launching a campaign to become London's Mayor. The former MP said "I want to give London back to the public with a referendum on whether people are willing to pay more for a 24-hour Tube." Unlike the New York Subway, the Tube does not have double tracks running in each direction on most lines. So the underground has to close down for cleaning and track maintenance work. For the benefit of a relatively small number of people who'd use the Tube in the small hours (apparently only 140,000 would benefit from the Tube running an extra hour at weekends) the cost & disruption of building extra tracks and all of the extra staffing involved would be enormous. I'd be interested to see Opik's ideas of just how much of a premium he thought people would be willing to pay. 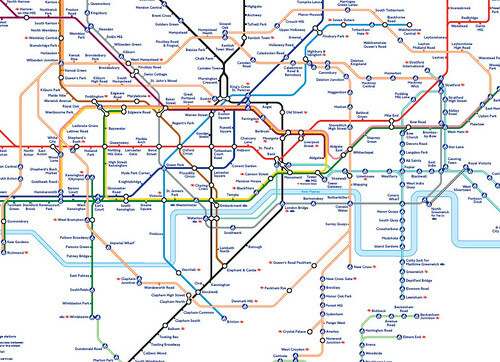 How much extra would you to pay to use the Tube for 24 hours? Secondly, it appears that a working party between TfL and transport unions RMT and TSSA has been set up to investigate running the London Underground for 24 hours a day during the 2012 Olympics. This is already leading to a pay battle over staffing. Union leaders are apparently demanding a pay rise of almost six per cent for Olympic year. Extra services are being mooted for nights of the opening and closing ceremonies to get people home. However, it's thought that later trains will be needed throughout the Games as some events will not finish until near midnight. A TfL spokesman said: "We are on track to deliver all transport improvements well ahead of the Games and are confident of supporting a fantastic London 2012 Games and keeping London moving. "We are now drawing up our detailed transport plans for the Games. 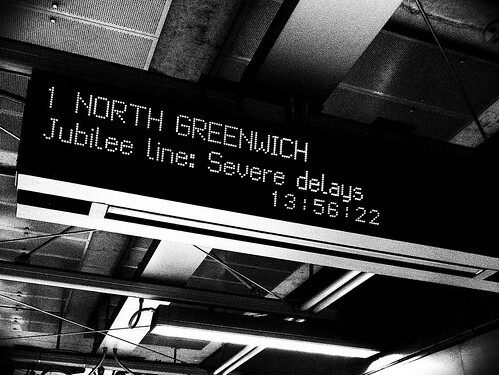 However, no decisions have yet been taken about the Tube's hours of operation during 2012." Incidentally if you're interested in seeing how the London Underground works at night, there's a lunchtime talk by Tube Lines' Trevor Bellis at the Museum of London on 14th March 2011 at 1pm. "Your night is my day: London's Underground never sleeps" covers the following: "As the commuters of London leave and the last tubes close their doors for the night, there are bands of people across the city descending unseen to work on the tube lines. What are they doing and what difference does it make to the lives of everyday commuting Londoners?" On the 12th and 13th March there's another of the semi regular open weekends of the London Transport Museum Depot at Acton. It's the overflow site of the museum in Covent Garden and you can explore over 70 rare road and rail vehicles. New to the collection and on show for the first time is the 1967 Tube stock driving motor car No. 3052. You'll be able to sit in a car where the Queen made one of her infrequent London Underground visits. 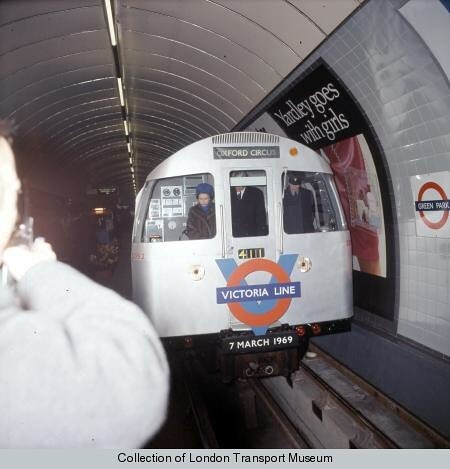 She travelled on it to launch the Victoria line in March 1969. As well as trains, the place is chock-a-block with signs, old ticket machines and other memorabilia ripped out of stations that have been refurbished. 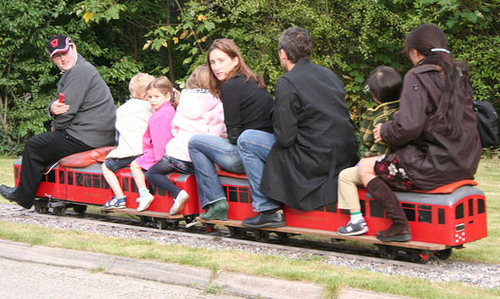 You can also take rides on the Depot’s miniature railway, which features steam & electric trains and full size heritage vehicles. For the weekend they are also running trips on the Wootton Electric Tramway, brought over from the Isle of Wight, which will carry visitors along its own tracks around the Depot powered by overhead electric wiring. To continue the London’s Transport in Miniature theme there's loads of working model railways from professional and amateur modellers. 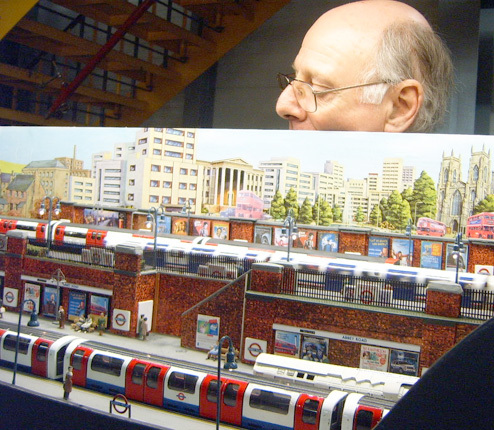 A must see is John Polly’s Abbey Road model (pictured below), a fictious London Underground station which is split over a level four platform station and based on Charles Holden's designs. If that's not enough to whet your appetite, specialist transport writer and broadcaster Christian Wolmar will give two talks each day at the Depot. Both talks will be centred around his newly published book Engines of War and also the highly popular Subterranean Railway: How the London Underground Was Built and How it Changed the City Forever . If you're going along IanVisits has some handy tips. Buy tickets in advance - they last all weekend, and avoid the often lengthy queues on the door. If taking a bag, make it a very small one as larger bags have to be left in the cloakroom. My camera bag just happens to snugly fit in their airport style measuring box - so I don't have to queue up to get my bag back when leaving. £10.00 for adults, £8.00 for senior citizens, £6.50 concessions and £5.00 London Transport Museum Friends. Accompanied children under 16 Free. To avoid the queues, tickets can be booked in advance by calling 020 7565 7298. (or in person at the London Transport Museum in Covent Garden). Full details of all the activities and opening & closing times are on London Transport Museum's site. Sounds like it will be a pretty packed weekend and here's a few posts from when I've been in the past. Tube Photo of the Week. 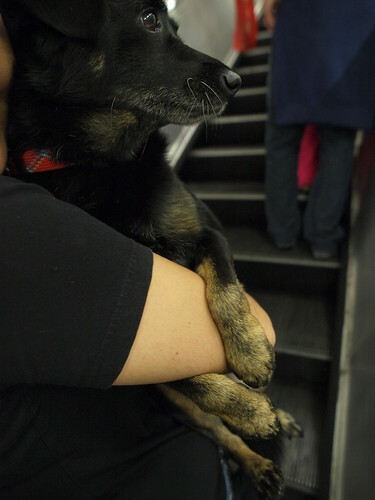 Great capture of a lovely dog looking relaxed and pensive while he or she is carried on the London Underground escalators. Seems much more at home than this little fellow who couldn't cope with the idea of going up stairs without making some effort himself! Not on an escalator, but I snapped this little furry creature who also enjoyed being carried on his Tube journey! 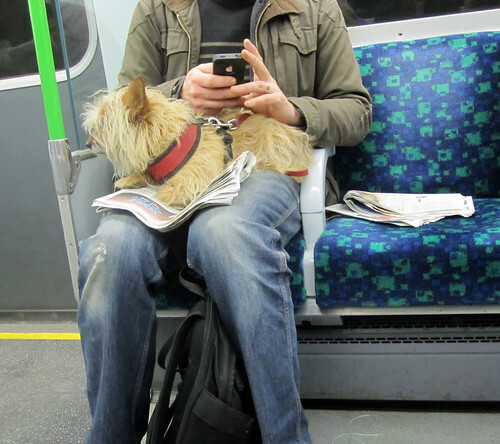 If you have any pictures of commuting dogs please send them my way. 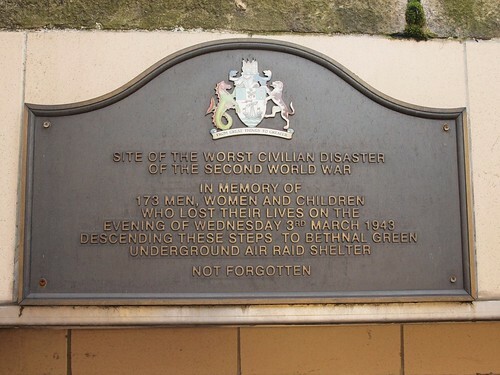 Novelist, Jessica Francis Kane, and London Transport Museum Curator, David Bownes, are giving an illustrated talk next week (Tuesday 8th March 2011) about the events that surrounded the Bethnal Green Tube station disaster in 1943. The tragedy which took place on 3rd March 1943 was the worst UK civilian disaster during the Blitz and led to the deaths of 173 people. They were crushed descending the steps to the Bethnal Green Underground air raid shelter in the East End All died from asphyxiation; not a single bomb was dropped. At the time, news of the disaster was suppressed. Although reports appeared in newspapers, the location and the extent of the disaster were withheld as the government wanted to prevent loss of public morale. During the talk David Bownes will present an historical overview of sheltering on the London Underground during the 2nd World War. Jessica will discuss how she researched her novel about the incident The Report and give readings from her book. John O'Farrell calls Jessica's novel "An utterly authentic journey into a little known tragedy of the Second World War, which transports you right back into one of the darkest moments of the blitz. Impeccably researched, yet the detail never feels intrusive." The talk starts at 6.30pm 8th March at London Transport Museum in Covent Garden. Tickets are £8 for Adults; £6 for senior citizens and £4 for students. Telephone 020 7565 7298 to book your tickets. 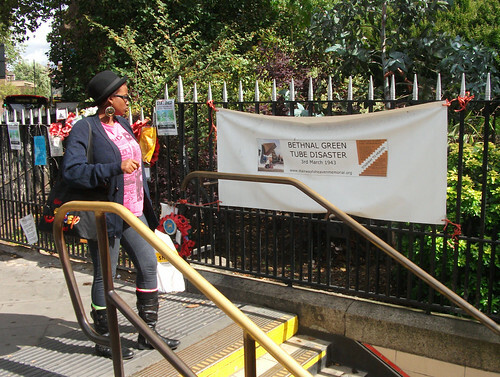 Also on Sunday 6th March there will be a Commemoration Service for the 68th anniversary of the Bethnal Green tube disaster at St. John on Bethnal Green Church (next door to the Tube station) at 2pm. There will be a blessing at the top of the stairs where everyone died. More details at Stairway To Heaven Memorial. Chris Stanfield put together the above collection of images from this year's Commemoration Service.